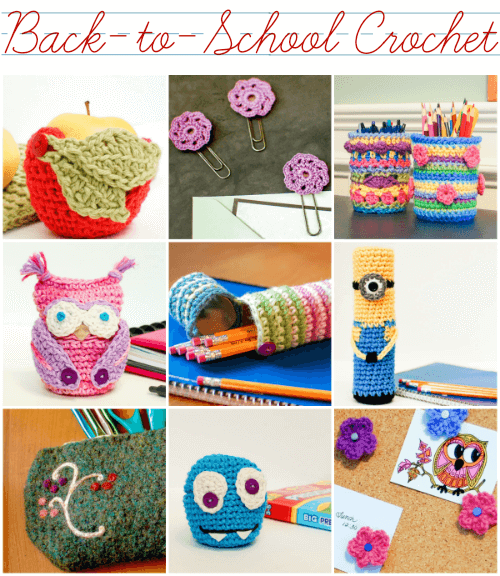 Kick off the new school year with these free back-to-school crochet patterns. These free back-to-school crochet patterns will definitely put a smile on your kids’ faces and make going back to school (and homework time) more fun! And if you think these are just good for the kids, think again. These patterns also make great teacher gifts and even help brighten up your own work space. These adorable apple cozies are great for keeping apples from getting bruised while bouncing around in backpacks, lunchboxes, and briefcases. This apple themed one is perfect for fall and back to school time. And don’t forget an apple for the teacher! It’s sometimes the simple everyday things that make a difference. Make paperwork more fun with these pretty flower paper clips. They work up so quickly too so you can make a whole bunch! No desk is complete without pens and pencils. Grab a mason jar and stitch up these colorful cozies to add some fun and color to homework time. Even better, you can use up some scrap yarn you have lying around. This apple cozy is perfect for owl lovers! I think they are absolutely adorable and actually designed this one for me to use. But be warned … everyone will be asking you to make one! These striped pencil cases offer such opportunity for personalization … think favorite colors, school colors, sports teams! They also make a great stashbuster. This minion pencil case is a spin off of the striped case above but designed for the minion lover in your life. For those who enjoy a more classic style, this felted case is for you. It’s a quick and easy crochet pattern and a great opportunity to try wet felting your crochet. And if you’re feeling super adventurous, you can even step it up with a pretty needle felted embellishment. Did I mention it also makes a great case for crochet hooks!! These monster cozies are ‘scary’ sweet! You’re little ones will love finding one in their lunch boxes. They are especially fun as Halloween approaches. Choose from these two designs: Blue Chomper or One-Eyed Greenie. Pin up important papers and reminders with these pretty push pins. They are sure to catch your eye to those things you want to remember. Thank you for these delightful patterns. I cannot wait to make them for my family and friends. Thank you for sharing. Lots of lovely projects, thank you for the patterns. I have been meaning to get my pen jar covered for ages, you have inspired me to get on with it!